Random House Trade Paperbacks, 9780812985153, 208pp. Naoki Higashida was born in Kimitsu, Japan in 1992. Diagnosed with severe autism when he was five, he subsequently learned to communicate using a handmade alphabet grid and began to write poems and short stories. At the age of thirteen he wrote The Reason I Jump, which was published in Japan in 2007. Its English translation came out in 2013, and it has now been published in more than thirty languages. Higashida has since published several books in Japan, including children’s and picture books, poems, and essays. 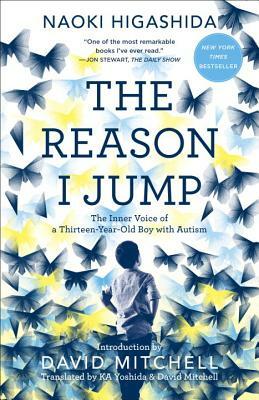 The subject of an award-winning Japanese television documentary in 2014, he continues to give presentations throughout the country about his experience of autism. David Mitchell is the author of seven novels, including Cloud Atlas, The Bone Clocks, and, most recently, Slade House. KA Yoshida was born in Yamaguchi, Japan, and specialized in English poetry at Notre Dame Seishin University. KA Yoshida and David Mitchell live in Ireland with their two children.